"This is an easy and elegant dessert. I get besieged with requests for the recipe every time I make it. Substitute any of your favorite fresh fruits for the strawberries, and it'll be still be just as delicious! You can also serve this in wine glasses because 1/2 cup servings are never enough." 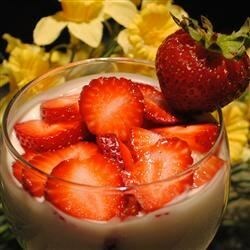 Combine the sour cream, sugar, yogurt, vanilla extract, and orange liqueur in a large bowl. Pour the whipping cream into a saucepan, and heat over medium-high heat just below the boiling point. Slowly stir the heated cream into the sour cream mixture. To serve, pour the cream mixture into 1/2 cup Irish coffee glasses to 1 inch below the rim. Top each glass with sliced strawberries.